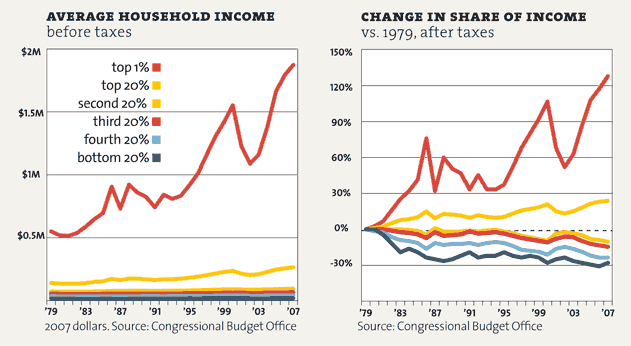 About 86% of Americans pay Federal taxes of some sort (because everyone who earns a paycheck pays payroll taxes). Payroll and sales taxes are highly regressive (they account for a much higher percentage of a lower income earner’s paycheck). This is what a standard paycheck looks like (in California). 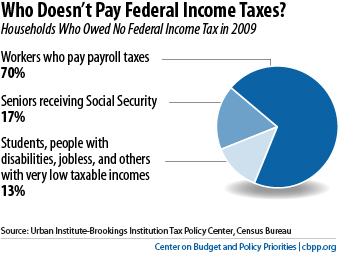 Those who claim that half of Americans pay no taxes are really just referring to the item 1 (federal withholding). That “half of America who pays no federal income taxes” are senior citizens receiving social security (because their social security checks aren’t subject to federal income taxes), students, people with disabilities and people who have seen their real income drop. Those who pay no federal income taxes are exempt because they are in the bottom tax brackets. These are people who’ve seen their wages drop as the majority of the country’s increased wealth has gone overwhelmingly to the top 1%. Everyone earning a standard income paycheck is subject to the payroll tax. However, the social security portion of the payroll tax only taxes the first $106,000 of income, making it highly regressive. What this means is that someone earning $500,000 is still only taxed that 6.2% on the first %106,000, which will amount to just over 1% of their total paycheck. On the other hand, someone earning $50,000/year pays that 6.2%. What’s more is that the burden for the payroll tax is likely carried full by these workers. Technically, an employee’s paycheck is subject to 6.2% for social security and 1.45% for Medicare. His/her employer is on the hook to match that, meaning these tax rates are actually 12.4% and 2.9% respectively, with the employee and employer each covering half. However, there is good reason to believe that employers shift this cost onto their employees by paying less in order to offset their portion, meaning that the employee is actually covering that 12.4% and 2.9%. How significant is the payroll tax? 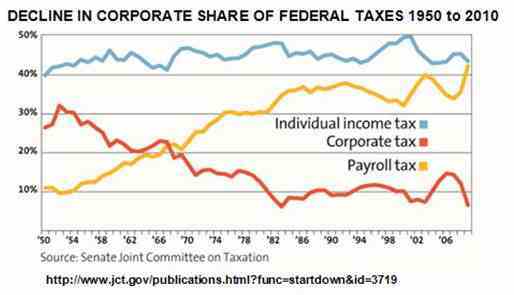 As corporate taxes have been cut, payroll taxes have carried more and more of the burden as a whole. What this means is that the tax burden as a percentage of the whole has shifted more and more to middle and lower income earners. Remember, a person with an income of half a million dollars pays not one dime more on the social security portion of taxes than a person making just over $106,000, because that’s where the SS tax cuts off.